Magnon – Interior Design Architect Bangalore is cautious about selecting one of the best interior trends for our customers. Commercial Design – Commercial design is meant for person who wants their business area to be designed. Business types include banks, hospital, retail outlets, institute etc. A commercial design is meant for employees as well as the clients who come to visit the area. Residential Design – This design is mainly done at place where the clients spend their rest time with family. It is mainly built for apartments and houses. The Interior design of this space is mainly designed for owner and also to give a show to guests who come in. While designing one commercial place to another, there may be lots of difference as it is based mainly on the nature of the business. In today’s world interior designing is having an emerging scope. But for the emerging scope the interior designers must have the capability of thinking creatively and must have the passion to bring new styles. In modern world all the style is just meant for a limited period of time as the changes in style is not stable. 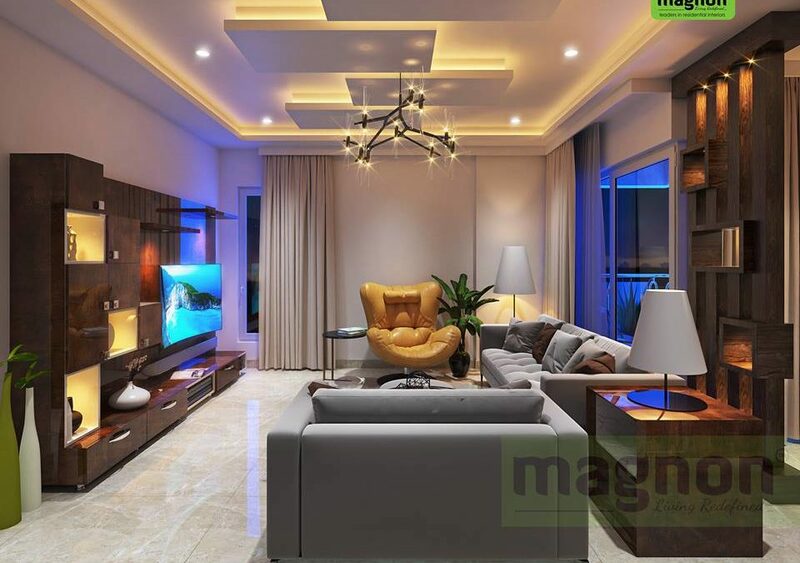 For Magnon Interiors, we were always able to cope up with the market demand and keep ourselves at the top Interior design architect in Bangalore with our creative style and passion on interiors. Interior designing is a field which will survive till the fashion in world exists but as the fashion changes the interior designing should also be able change their styles accordingly. Contemporary design is type of interior design which is meant for person who likes to keep the traditional style to be involved in modern style. In Contemporary design we try to make comfortable without making it much darker. Likewise it is also appropriate for commercial areas such as offices and stores. A Contemporary style is further defined by simplicity and cleanliness furthermore contemporary design it tends to show much more spacious. While trying to make your space look contemporary there are some basic factors to consider such as color should be pale black or white. Another factor to be considered is the line and space as it is necessary for contemporary design to have either straight vertical or horizontal lines or curved shapes. Comparing to the space in contemporary design, there should be ample space among the furniture’s as it should look unique from one to another. In a contemporary design it is better to have furniture’s without curves or decorations. Floors in contemporary design should also be smooth by using wood and tiles. Include color and metallic style to light fixtures with track lights and recessed lights. Try using a spot light directing to a paint or poster which can give the contemporary style with eyes focusing on these paintings. When designing a contemporary design try to make ample space without making it rigid using lots of furniture’s and other items in the room with dark colours all over the room. For the best you can also use metal, stone and other art works to decorate contemporary style. Classical Interior design is a type of interior designing meant for person who loves the historical stories. It gives a look of traditional style it is both mix of Greek and Roman interior design. As the name suggests, it try to give a classical look that bring out the older classic touch to the current period. Classical Interior designing is a stable form of interior designing as the trend of these types of designing never goes out of demand. So, if you are looking for a classical touch to your interior we have one of the best classical ideas for your interiors. A good classical interior designing can give you a space for peaceful mind with lots of space for air circulation and is calm and quiet. A classical interior is influenced by classicism – a reverence for the classical period and its aesthetics – and the Western classical tradition. Bring home the traditional style with Magnon known as the best Interior Design Architect in Bangalore. One of the key features to be considered while designing a classical interior designing is that it should have a symmetry and balance. Try to add a large mirror, wooden statue, beautiful table that can give others a focal point in viewing the room. While in Classical interior designing it is further required to have natural brown, green and brown colours. For this purpose you can even use terracotta. For more of the ideas of classical design contact with Magnon Interior Design Architect in Bangalore, we can really take you back to your traditional days. Our experts is having a great experience in providing our own styles in the field of providing classic touch to the interior designs for most of our customers. While we discuss about contemporary design, there is conception about modern and contemporary designs are same. Modern and contemporary designs may have some similarities but they are not the same. In Modern design as the name suggest they look mostly in entering latest styles and trends. In a Contemporary design there is a mix of some traditional style with the modern style. Interior designing is not just a work. It is an art which requires passion, interest and creativity to bring out new trends. The designing should be able to change according to the changes being made out. There is always speciality in designing one of the best interiors by us as we make it unique for every customer. Contact with Magnon – Interior Design Architect in Bangalore for the best contemporary and classic interior design.